Learning to surf is far more than starting a new sport and acquiring the skills necessary to compete. It’s about learning the culture, participating in the lifestyle, and having the time of your life. However, surfing can be a bit intimidating at times, and even dangerous if done incorrectly. We’ve all have heard stories of “surf rage” and “locals only” spots, and we’ve all seen gruesome surf injuries. At Swell Surf Camp, we want you to be well rounded surfers that could fit in at any break in the world at the end of your surf holiday. 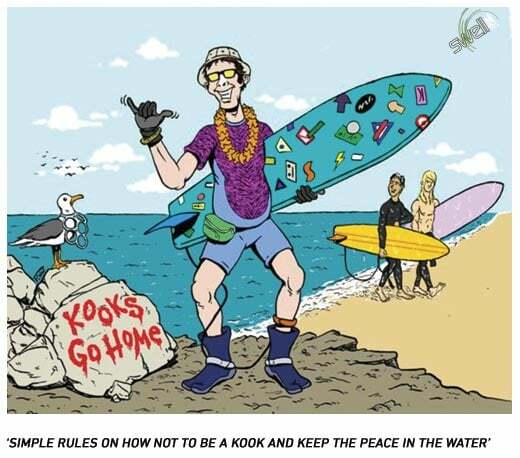 The Golden Rules of Surf Etiquette. While this may sound a tad condescending, understanding your own abilities in the water and humbly accepting them could save your life. If you’re still learning and you paddle out at an advanced wave, whether that’s a shallow reef break or any break on an overhead day, you run a high risk of injuring yourself and endangering those around you. When you surf breaks within your ability, you can learn and progress, so that you can eventually surf more advanced breaks. 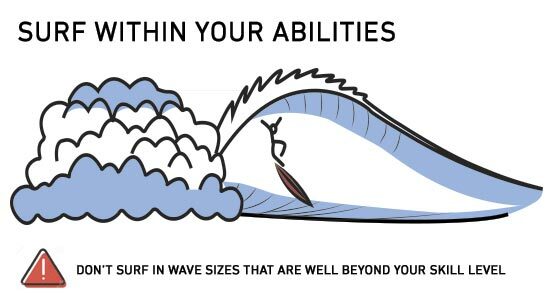 When you learn to surf at Swell Surf Camp, your lessons will always be taught at breaks that reflect your ability. One of the best things to do when arriving at the beach is to observe the waves for 10-15 minutes to make sure the surf spot is right for your abilities; just because the wave at a certain spot were great yesterday for your ability does not make it safe today. The most important thing to know when paddling out at a crowded line up is that the paddler yields to the riding surfer. 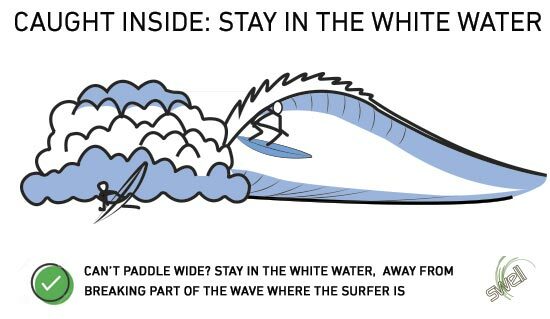 Meaning that if your paddle trajectory has you colliding with a surfer who is riding down the line of a wave, it is your responsibility to yield to that surfer, not the other way around. 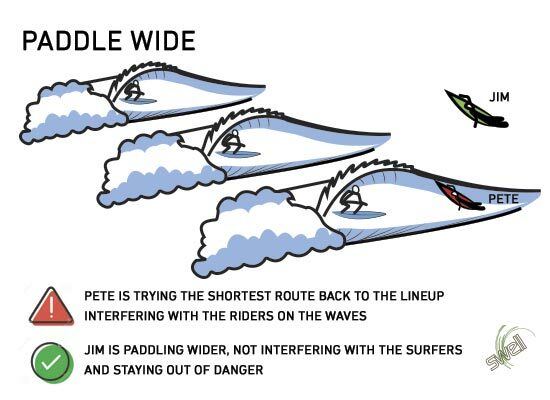 In this example, Pete might be able to get back into position quicker, but he is also potentially getting into the way of the surfers on the wave. You don’t want to slalom through surfers when you are surfing. For safety and courtesy to other surfers, paddle wide of the surfers, back to the line-up, like Jim is doing in the picture. Whether you’re paddling out to a line up with 5 people out from your surf camp or 50 strangers, the rules are the same. Be polite, smile, and say hello. It will bring a feeling of levity to everyone around and it will likely put you in the good graces of local surfers. No, you’re not surfing a WSL heat, but priority still exists at every surf break. To put it simply, the surfer closest to the peak of the wave has priority over the surfer who is farther from the peak or on the shoulder. Understanding priority is key to existing peacefully in a crowded lineup. This may seem like a no-brainer, but it happens often. A surfer is riding down the line when all of the sudden, another surfer appears on the wave and tries to hop to their feet. Dropping in on other surfers is what usually leads to conflict in the surf world, thankfully it’s easily avoidable. It starts with understanding priority, if someone inside of you is paddling for a wave, then you shouldn’t even try to paddle for it. Awareness plays a role as well, even if you don’t see anyone near you paddling for a wave, as you paddle look to your left and right to ensure no one is riding down the line that might have dropped on at another peak. 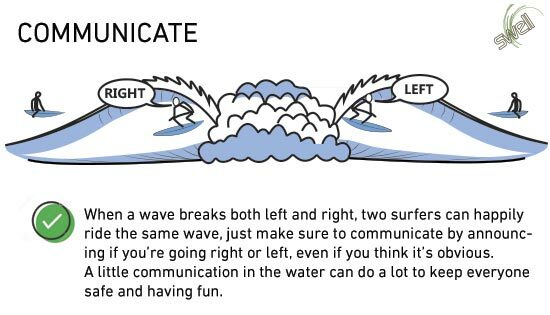 When a wave breaks both left and right, two surfers can happily ride the same wave, just make sure to communicate by announcing if you’re going right or left, even if you think it’s obvious. A little communication in the water can do a lot to keep everyone safe and having fun. Just because you can catch every wave, doesn’t mean you should. If you’re on a large foam board or longboard that catches waves easily, it doesn’t mean you always get to take the wave from the shortboard next to you that’s looking to practice turns and airs. Always keep in mind that the ocean is for everyone and act accordingly. Most surf injuries are not caused by the seafloor, other surfs, or wildlife, they are caused by surfboards. Surfboards are rock solid and have sharp fins, they can do some serious damage. 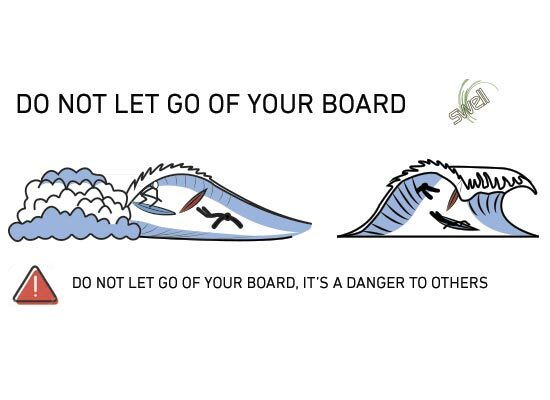 That means using a leash, not abandoning your board during your paddle out or after a wipeout. If your board is near you and you have a tight grip on the leash, or your board is under you, it won’t hurt you or any other surfer in the water. This is a crucial step for surfers of any level, but it is often skipped. If you’re about to surf at a new break, take a while to watch the waves. Notice where they are breaking, where the channels are, and what the current / rip tide is doing. If you can, take it a step further by asking another surfer about the spot. This one is obvious. Don’t litter, don’t’ leave anything behind. Pack in and pack out. You can even take it a step further and pick up any litter you might encounter. We love our local surf beach, and we do everything we can to keep it beautiful. We get it, accidents happen. You messed up, and that’s okay, as long as you apologize. It may seem trivial but making amends and making your intentions clear go a long way in a crowded lineup. Lastly, if someone else in the water wrongs you, if they burn you, drop in on you, or send a board flying at you, forgive and forget. 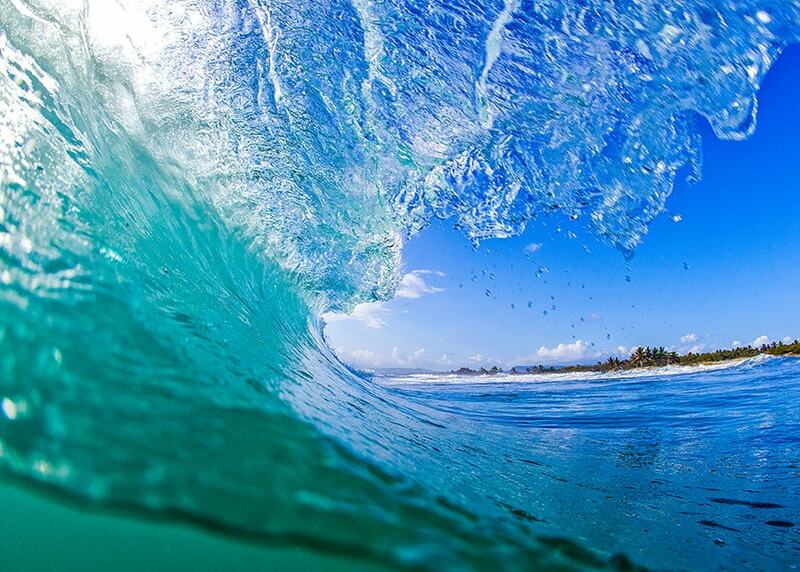 No one likes to surf mad, and no one wants to be around an angry person. There are numerous off shore reefs that are ideal for Stand up paddle surfing, in and around Cabarete, so there’s no need to bring a dangerous SUP board & paddle into a lineup where there are kids and learners. Find the open spaces up and down the coast. This also applies to the new sport of foiling. Too dangerous to other surfers at our local surf spot. No motorized watercrafts at Playa Encuentro. No JetSki’s anywhere near Playa Encuentro, they are noisy, smelly and dangerous to the other surfers. Surfing is more than just a sport, it becomes ingrained in us the moment we catch our first wave. 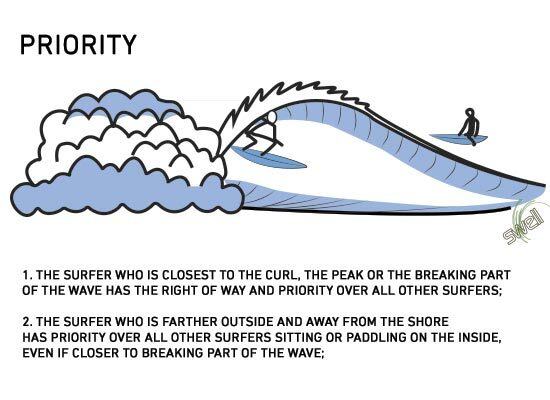 In order to enjoy surfing to its fullest potential, stay safe in the water, and share it with others, we must stick to The Golden Rules of Surf Etiquette. We have travelled to a lot of different countries and have seen 1000’s of different surf spots & one of the things that really makes our local surfing beach stand out is the mellow & friendly vibe between locals, expats and visiting surfers. Let’s keep it that way, let’s all stick to the surf etiquette, so we can all leave the water after a surf session with a big smile on our faces.